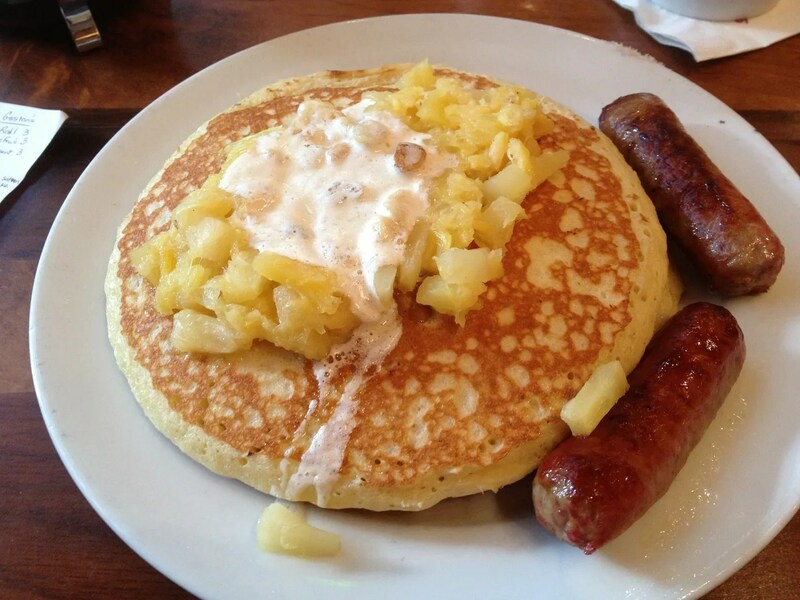 Ahhh… Macadamia-Pineapple Pancakes. How do I love thee? Let me count the ways. 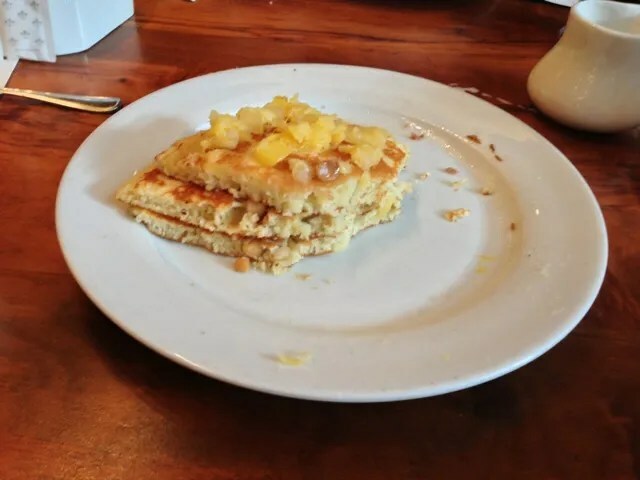 But before you pat me on the back for almost cleaning my plate, I must confess that my husband had more than a few bites of my pancakes. Speaking of which, have you noticed a pattern in my husband’s eating on this trip? You may recall that, in an attempt to not gain any weight on this trip, he and my daughter made a deal to share one entree during all of our meals. That plan may have been successful if he hadn’t also then eaten a good portion of my meal as well. 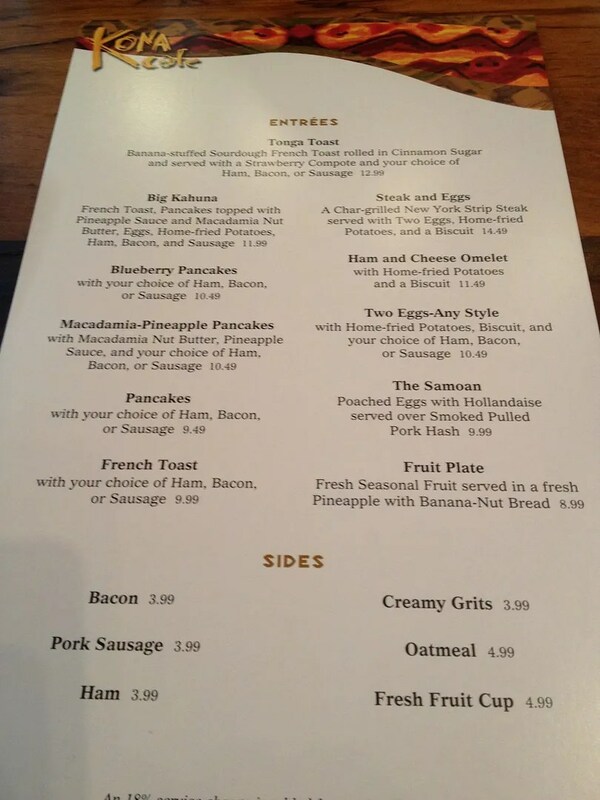 Let’s see, there was my salmon at Artist Point, my Colony salad at Liberty Tree, and now my Kona pancakes. Just sayin’. They wanted me to be sure to note that the addition of the peppers made the difference between a rating of 2 and 3. Other than rating it a 4, my son didn’t say too much about his Tonga Toast. 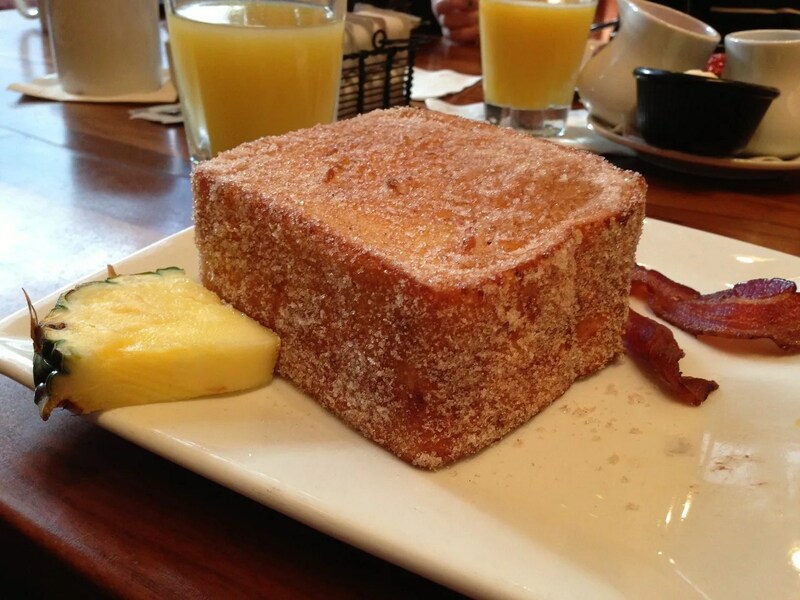 However, this is what he ordered the last time he was here for breakfast, so the fact that he ordered it again seems to indicate that he is a fan. 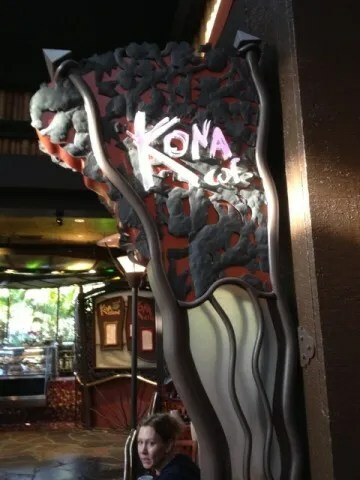 For those of you who have dined at Kona Cafe, you know that Kona can be a very loud restaurant. So of course, DH couldn’t resist the urge to make a snide remark regarding the noise. And despite the fact that I gave him a pretty good kick underneath the table , my son proceeded to tell his father about the app that he now had on his phone. 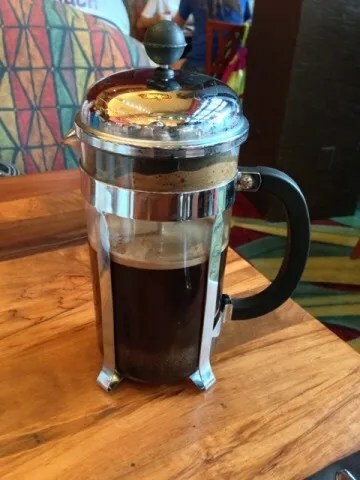 So what was the noise level of Kona Cafe during their peak breakfast hours? Almost 80 dB. Not as bad as Tony’s the night before, but high enough to prove my husband’s point and give him a reason to gloat. And not just to us, but also to our waitress. When he told her about the iPhone app and the measurement that we had taken, she laughed and said that she was used to the noise because she usually worked at (the currently closed for renovations) California Grill. It was then that the “penny finally dropped” and a quick glance at her name tag confirmed…it was Dawn, our absolutely wonderful server that my husband and I had when we dined at California Grill during our 25th Anniversary trip. 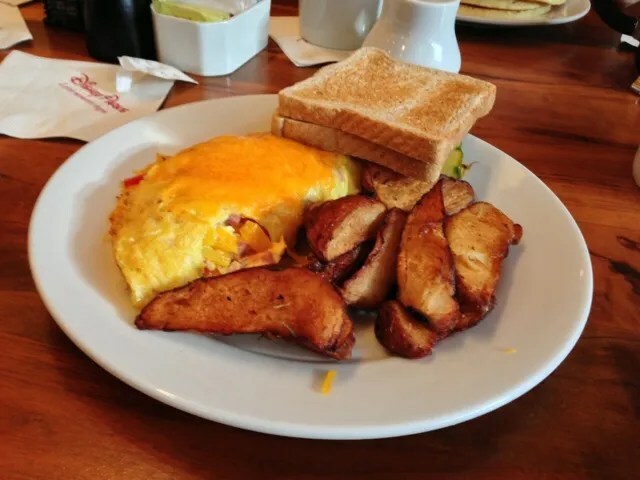 And so I had the good fortune of having a little “taste” of my favorite California Grill along with my much-loved Kona pancakes that morning…and I didn’t have to shovel any snow to get there. Life is good!! !